A Sad Day in L.A.
Paging through the photo album a while back, I found a newspaper clipping that reported on an upsetting, life altering change for Ursula and her mother, Clara. 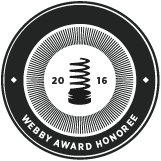 The timing wasn’t right to share it on Mystery Dancer then, but our story calls for it now. June 19, 1913 was a sad day for Ursula and Clara. Ursula’s father, Alfred Dudley Cheshire, had been ill for several months and died on that day, just 10 days after Ursula’s 11th birthday. Even though Ursula lived more than a hundred years ago, and I didn’t know her (duh! ), I feel so sad for her losing her father at such a tender age. According to the article that appeared in The Morning Union (a daily newspaper covering Grass Valley and Nevada City, California between 1908 and 1945), Alfred was born in Hamilton, Canada, and emigrated to the United States “when a mere youth.” I know from census records that he was born around 1853 and would have been about 60 years old at the time of his death. 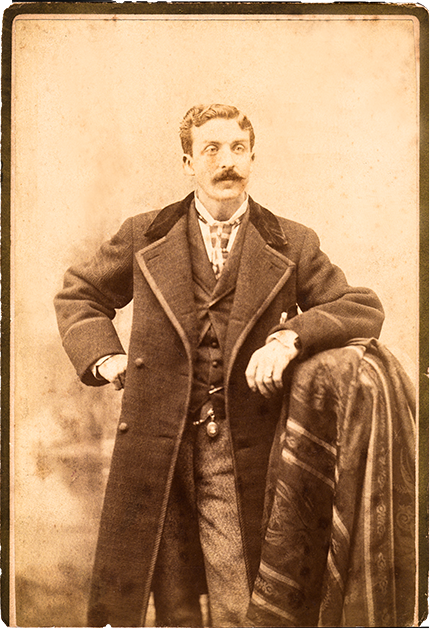 Alfred first settled in Michigan and became an expert cabinet maker before relocating to San Francisco in 1830. 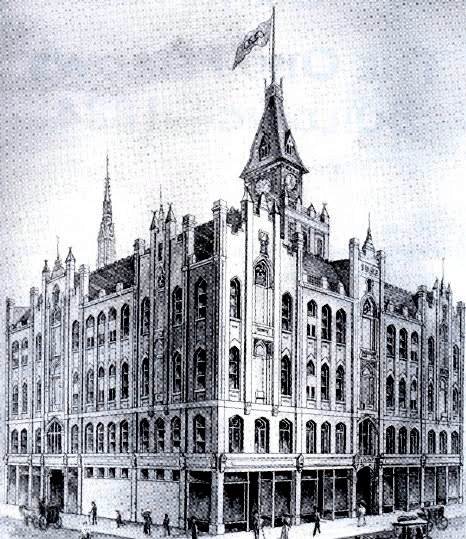 There, he began a career in undertaking and eventually came to own the California Undertaking Co., which he sold “in splendid advantage” around 1903. Alfred and Clara married in 1899. The full article appears below. Rest in peace, dear Alfred. 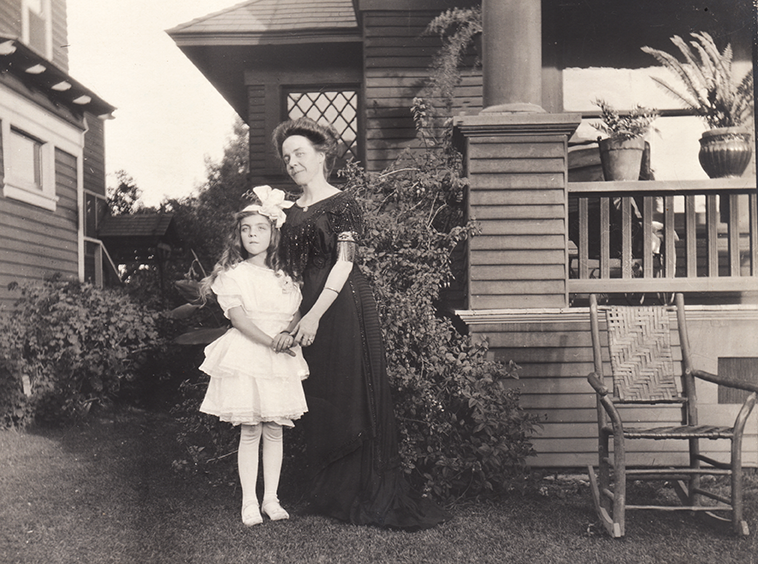 Nine-year-old Ursula and her mother, Clara Uphoff Cheshire, in front of their LA home. I love Clara’s dress! Tucked between the album’s pages, I found several loose photographs from around the same time, all stamped “SEP 10 1911” on the back (which probably means they were processed, not necessarily taken, on that day). It looks like they may chronicle a multigenerational family gathering over at least a couple of days. 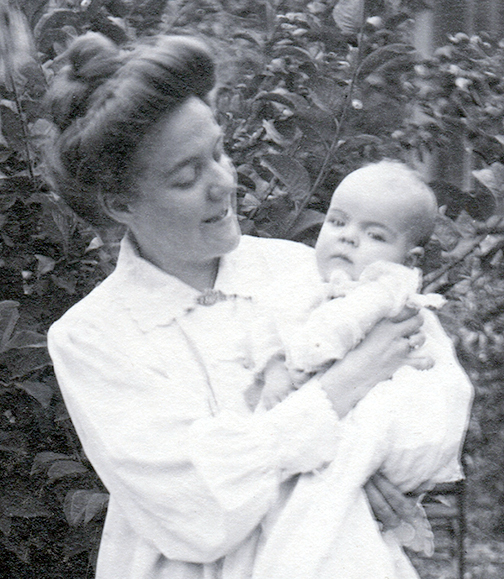 Matilda Denzer Uphoff, Ursula’s maternal grandmother. Check out the fancy rope work on her dress. 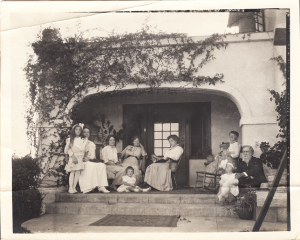 I see 9-year-old Ursula and her mother, Clara, in two of the photos, but who are all the other people? Only Ursula’s maternal grandmother, Matilda Uphoff, is identified on the back of the photo of her standing outside at the Cheshires’ house. 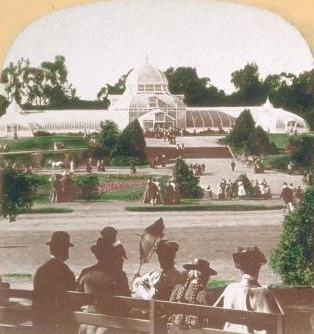 I’ve been doing a bit of detective work, and I think I know who everyone is in this collection of photos, except for, in the photo below, the woman at the back resting her chin on her hand, and the ghostly young girl at the far right! I found my first clue to the identity of some of these folks in an item published in the “Society” column of the Los Angeles Times. Dated the same day as the photos, it read: “Mrs. Cheshire Entertains. Mrs. A.D. Cheshire of No. 1422 Malvern avenue [sic] entertained fifty guests Wednesday evening in honor of her mother, Mrs H. Uphoff, and her sisters, Miss Mathilde Uphoff and Mrs. C.R. Pemby, all of San Francisco. I’m not sure at whose house they are gathered, as it is not the Cheshires’ Malvern Avenue home, but it may belong to the chin-in-hand lady, perhaps a family friend. 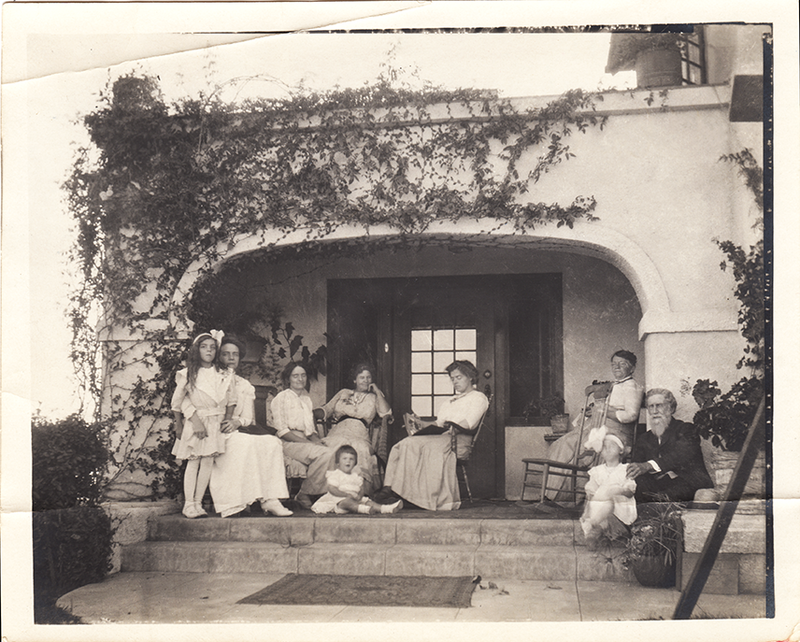 Based on subsequent research described below, I believe this photo features (left to right) Ursula, Clara, Ursula’s Aunt Jeannette, little cousin Marion, unknown (chin-in-hand lady), Aunt Mathilde, Grandmother Matilda, unknown ghostly girl, and father Alfred. At first I thought Alfred was Ursula’s grandfather Herman Uphoff, but then I remembered he died in 1909, and on closer inspection, this man’s nose and hairline look a lot like Alfred’s as depicted in much earlier photos. He would have been 58 at this time. 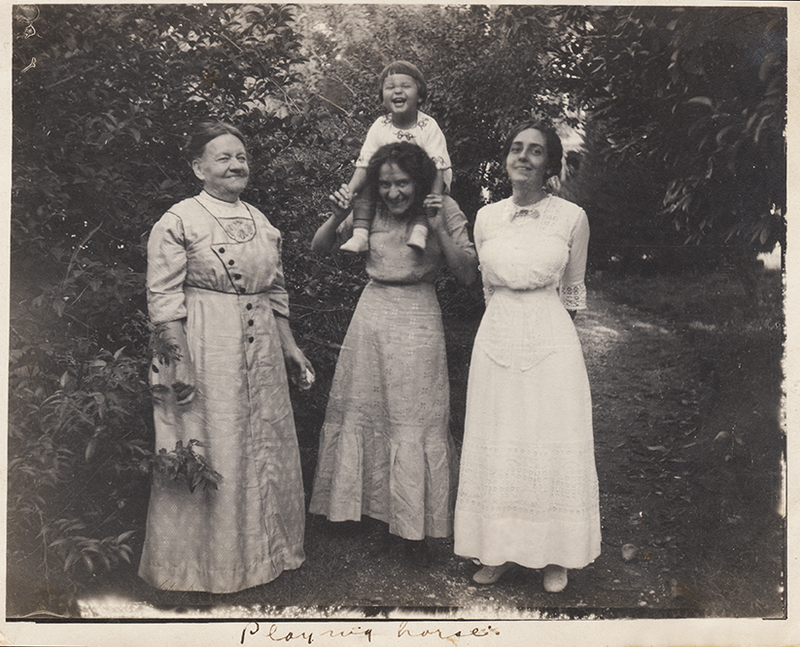 I believe the photo below depicts (left to right), Matilda, the matriarch of the family; Jeannette with her brother Charles’s daughter Marion on her shoulders (“Playing Horse”); and Mathilde. It took me a little while to decide which woman was Ursula’s Aunt Mathilde and which was Aunt Jeannette. I think it more likely that Jeannette is on the left because a) she looks more harried and physically more likely to have had a baby just over a year before than the more fresh-faced, small-wasted woman on the right; and b) when I blow up the photo, I can just barely make out a shape that looks like a ring on her “wedding” finger. 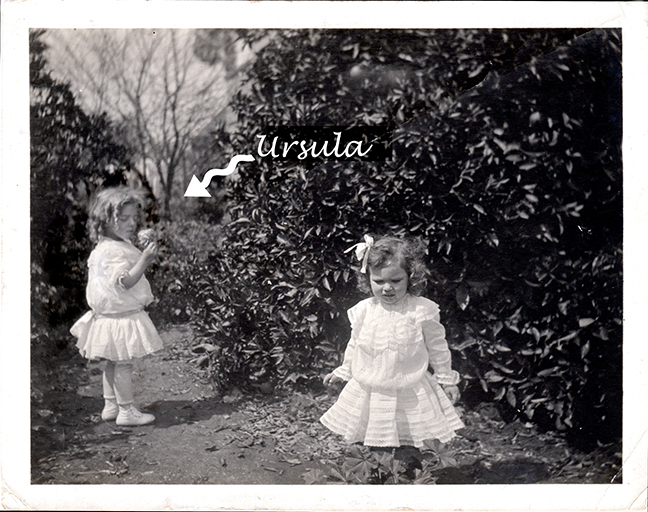 I think the little girl is Ursula’s cousin Marion, because she looks about 3 years old—the right age for her at that time—and because her father, Charles, was working as a miner and living in Nevada around that time. Since his wife, Grace Key, had died in 1909, possibly from complications of childbirth (as Marion had just been born in 1908), I imagine he left his daughter to the care of her aunts or grandparents while he was off making a living. Back to the photo taken on the front porch…Notice that Aunt Mathilde is perusing what possibly could be a photo album, and it makes me wonder… is she is looking at some of the very same family pictures I have in this velvet-covered antique photo album (which, by the way, belonged to Ursula’s mother)? There’s that thread again, stretching from 1911 nearly 103 years to 2014. I can’t wait to see what I discover next! Did Secret Societies Influence Ursula’s Destiny? So, I have a theory about how Ursula’s parents, Alfred and Clara, met. And, based on a historical tidbit I discovered today, I have another, related theory about how our Mystery Dancer came to be named Ursula. 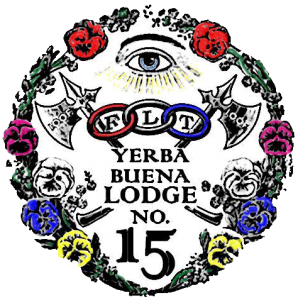 In my version of events, it all started with two secret societies: the Odd Fellows and the Native Daughters of the Golden West. 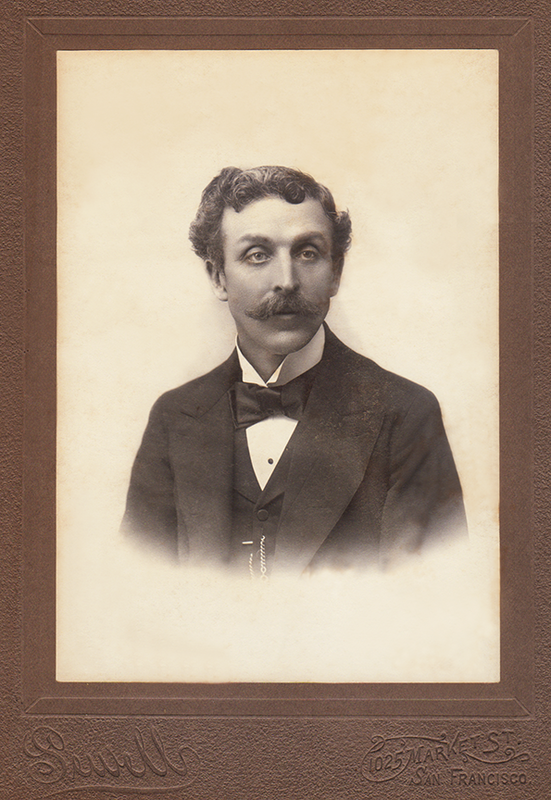 Alfred at age 24. He would marry Clara 25 years later. 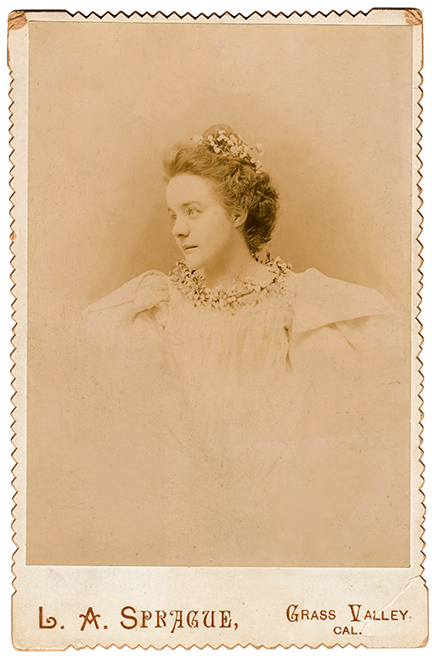 Clara at age 23. She would marry Alfred 7 years later. 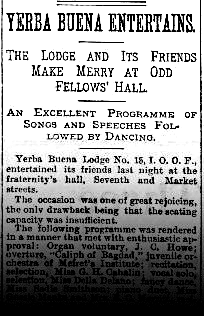 Odd Fellows events for members and friends included music, speeches and lots of dancing. According to voter registration records from the early 1890s, Alfred was five-foot-nine with dark hair, a dark complexion and blue eyes. Did those eyes spy Clara among the ladies and gentlemen on the dance floor at a club event like the one described? Perhaps she was one of the “friends” invited. It’s possible. 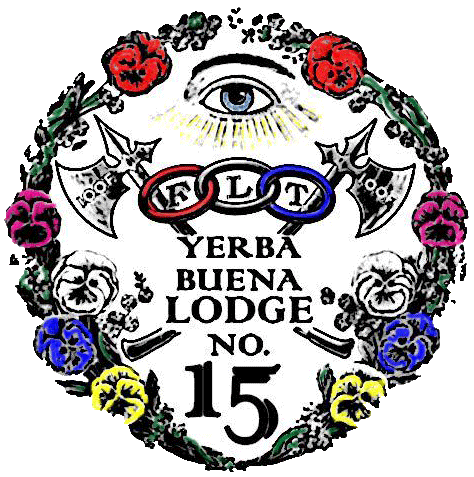 You see, Clara belonged to a similar organization: the Order of Native Daughters of the Golden West, a fraternal and patriotic organization of California-born women. 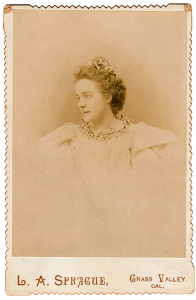 While Clara was active in the group’s Manzanita Parlor No. 29 of Grass Valley, she no doubt had friends, or at least acquaintances, in the San Francisco parlors, as she was a delegate to the 1896 Grand Parlor meeting held in Napa, and served as an elected officer in 1898. The Native Daughters and Odd Fellows worked together at times, for instance in 1897 organizing San Francisco’s Carnival of the Golden Gate, the purpose of which was to attract visitors to the city. Perhaps one of Clara’s Native sisters invited her down for the event and she met Alfred then. It’s just a theory, but I like it! In any case, they did meet each other, and married in 1899. 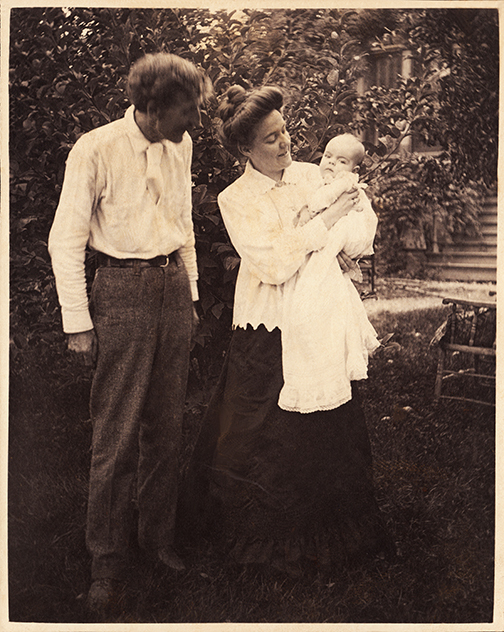 Clara became pregnant with Ursula in 1901. 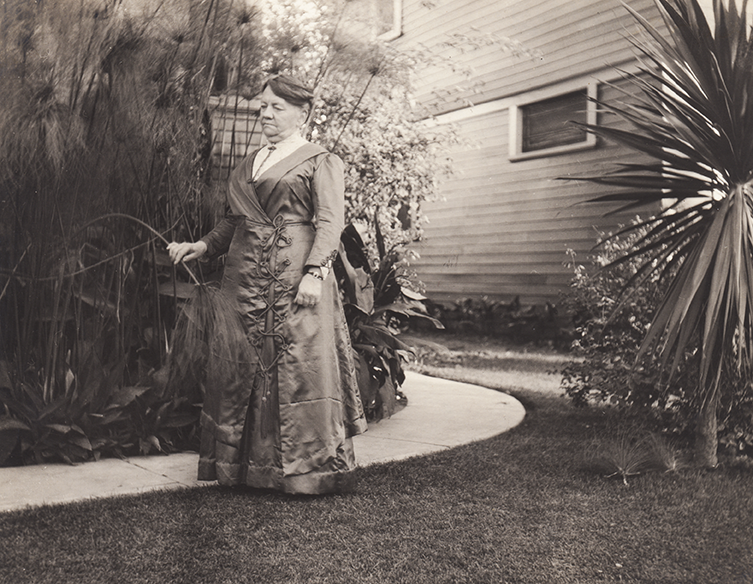 My second theory related to the secret societies is that, while thinking of names for her impending baby, Clara was inspired by the history of the Native Daughters of the Golden West, the group she devoted time and energy to in the years leading up to her marriage. I was thrilled to learn today that when the Native Daughters group was founded in September 1886, its charter members selected for its first Parlor (akin to a Lodge) the distinctive name of “Ursula” (meaning “little she-bear”—suggestive of courage and strength)! While researching Ursula and her family via the Library of Congress’s “All Digitized Newspapers 1836-1922” website, I discovered a bit more about their Baker Street home in San Francisco, where Ursula lived as a little girl. 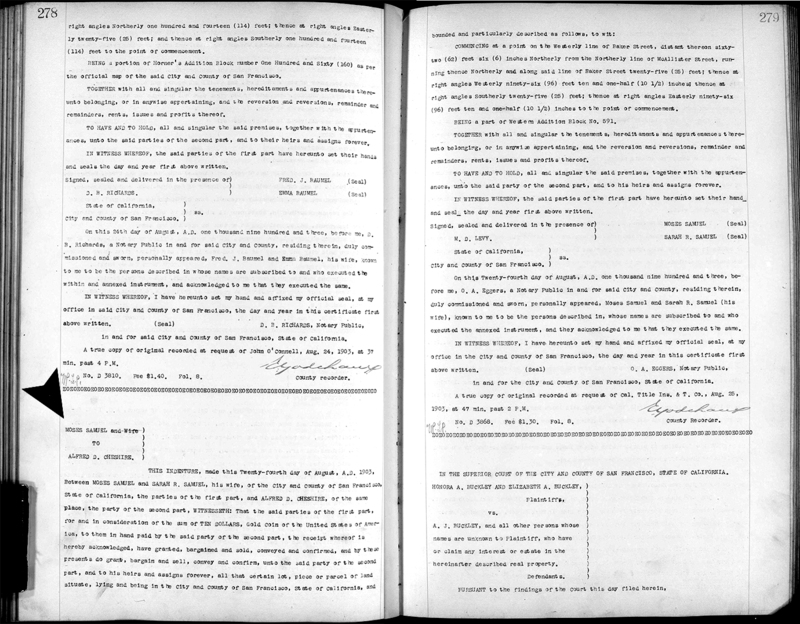 My previous post included a link to the deed for the lot on Baker Street that Clara’s father, Alfred, bought in 1903. When I initially read the deed, I had been puzzled that Alfred bought the lot for just $10. It didn’t make sense that it would be so cheap, unless perhaps the house hadn’t been built yet. Maybe the real estate records stating the house was constructed in 1902 were wrong, and the Cheshires had the house built in 1903. But that didn’t make sense either—$10 still would have been a ridiculous price for the lot. And now I know why. 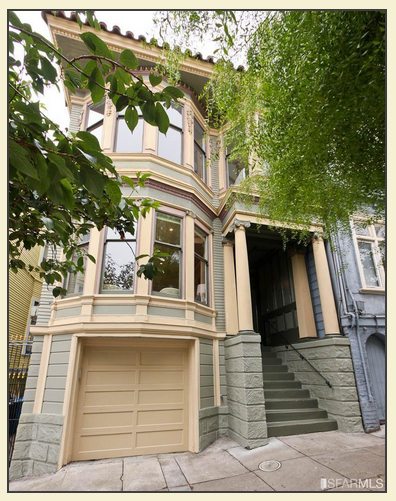 The $10 must have been just a legal formality to purchase the lot, because Alfred actually paid $9,250 in August 2003 for the new 2,400 square-foot, 2-flat house, as I learned from the Real Estate section in The San Francisco Call. According to the article, residential properties were in strong demand at the time. $9,250 was no small potatoes back then. According to the U.S. Department of Labor’s inflation calculator, if he had paid that amount 10 years later in 1913 (the earliest date for which statistics are available) it would be worth about $219,000 in today’s dollars. Since he paid the amount in 1903, it presumably would be worth even more today. The Cheshires lived at 715-717 Baker Street for the first several years of Ursula’s life. The home sold for more than $1.5 million in 2011. Compared with present-day real estate prices, however, Alfred paid peanuts for 715-717 Baker St. He would be laughed out of the real estate office if he bid $219,000 for the house today—almost exactly two years ago, this hot property sold for $1,635,000! The real estate listing from 2011 describes the building as consisting of two large, remodeled, full-floor Victorian flats with period details, beautiful wood floors, high ceilings, bay windows and fireplaces. I wonder if the new owner would be interested in learning about the first family to walk across his home’s wood floors, play piano in the parlor, peer out the bay windows and warm themselves by the fire. 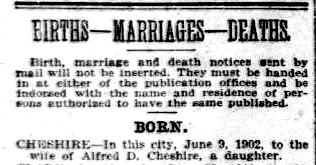 The “San Francisco Call” announces “a daughter” (Ursula) is born to “the wife of Alfred D. Cheshire.” Poor Clara doesn’t even get credited by name! I’ve been having fun researching Ursula’s early life, and have found several mentions of her and her parents in early 1900s San Francisco and Los Angeles newspapers, mainly in the “Society” columns. I feel like I am on a treasure hunt, and for me, the clues I am discovering are the individual coins, gems and jewels that are amassing one by one in the chest that holds Ursula’s story—the ultimate treasure. 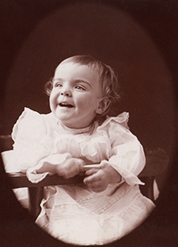 she indeed burst into the world on June 9, 1902, which I had earlier deduced from the penciled caption on the back of the baby picture at left, which noted the photo was “taken Sept. 14th, 1902, baby age 3 mos., 5 days.” Another copy of the same photograph announced that Ursula weighed 12 pounds (!) at birth. 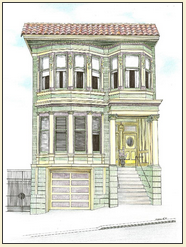 At the time of the 1900 Census, Ursula’s parents, Clara and Alfred Cheshire, were living at 516 Jones Street in San Francisco (just three blocks south of where my husband and his ex-wife lived in the late 1980s!). 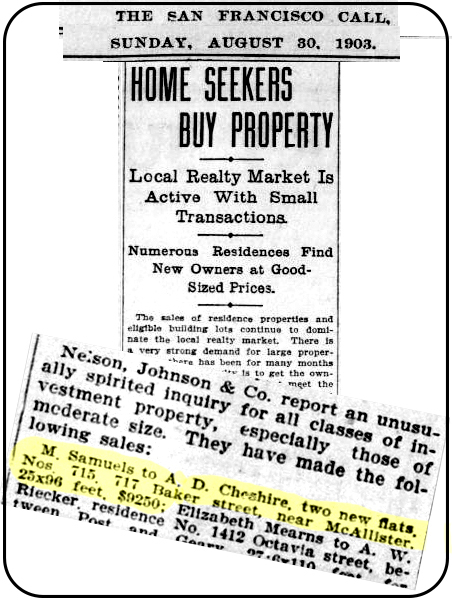 The Cheshires may still have resided there at the time of their daughter’s birth, but in August 1903 when she was one year old, they bought a lot on the west side of Baker Street, just north of McAllister. I discovered this in the “Real Estate Transactions” column in the San Francisco Call, which let me to an index of deeds, and then to the deed itself (which I found at familysearch.org). 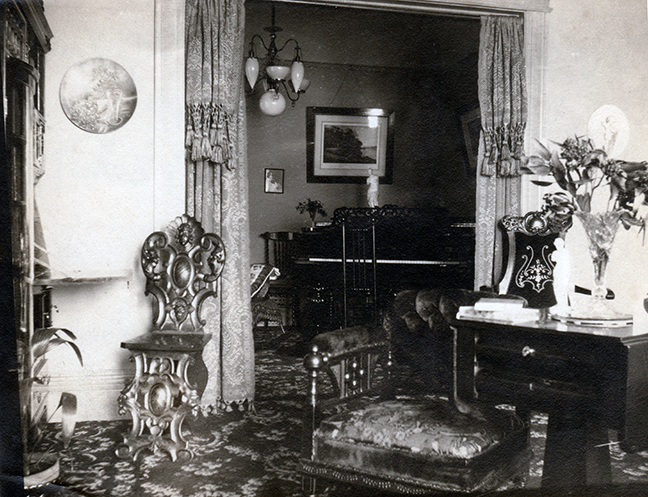 The inscription written on the back of the photo below of the interior of the Cheshires’ home confirms their residence as 715 Baker Street, where they lived when Ursula “was small.” According to San Francisco property records and a contemporary real estate description, their house—which still stands!—was a Victorian dwelling built in 1902. As you can see from the picture, Clara and Alfred decorated it in typical ornate Victorian fashion. 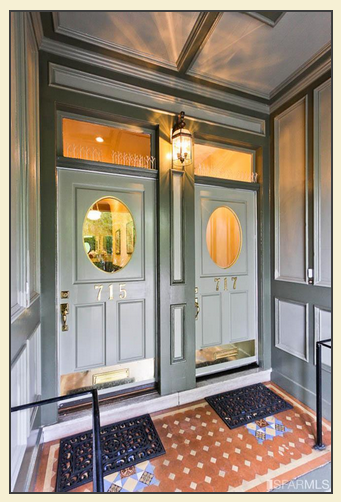 You can see what the exterior and interior of the home look like today, including some period details, in photos appearing on a 2011 real estate listing. 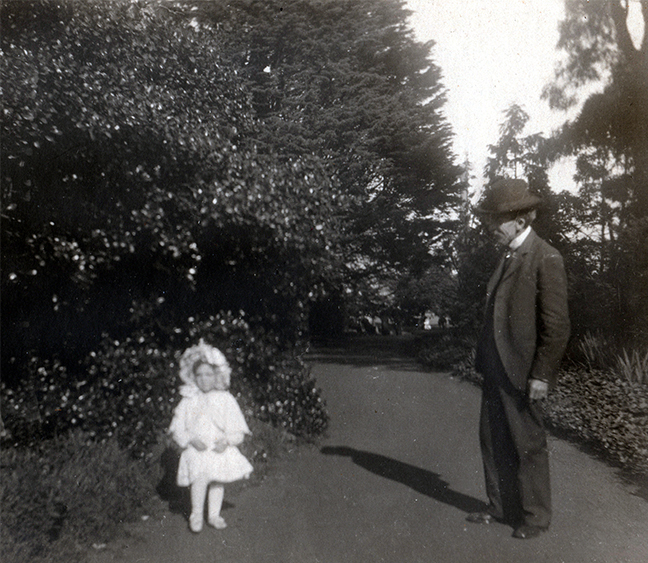 Ursula and her father, Alfred…at Golden Gate Park? Ursula (left) and friend…at Golden Gate Park?